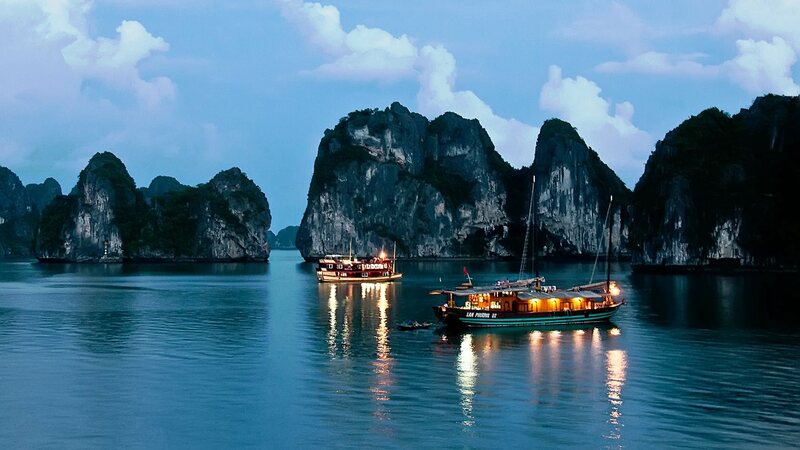 Halong Bay is one of Mother Earth’s most amazing natural wonders and one of Vietnam’s most prized treasures. 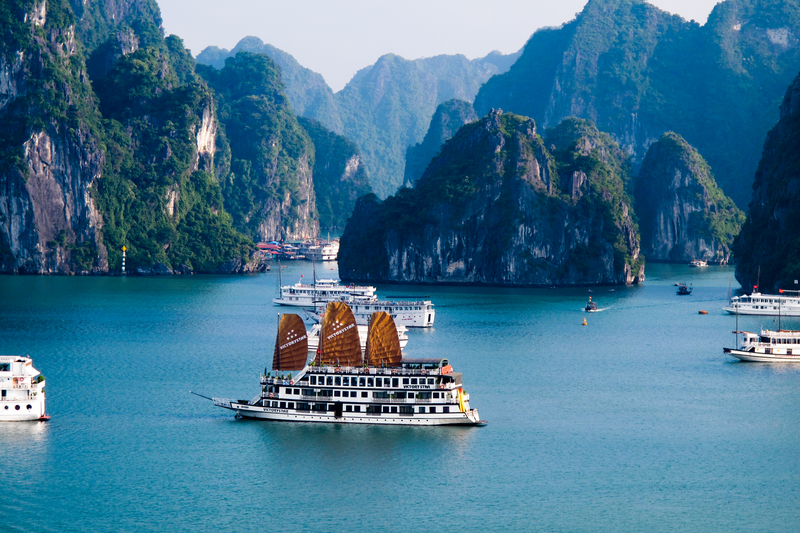 A comfortable 3 hours drive from Hanoi, Halong Bay is in Northeastern Vietnam on the shores of the Gulf of Tonkin. The bay is dominated by more than 1,600 limestone karsts and islets which rise out of the waters of the bay to heights of up to 100 meters (330 feet) and the numerous caves and grottos spread throughout the bay. 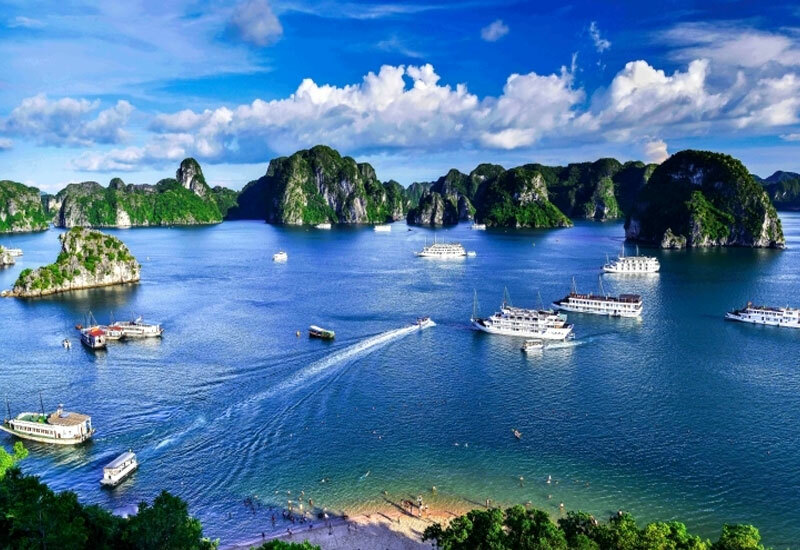 Abundant scenic beauty, archeological and geological significance, cultural and historical connections, fresh seafood and proximity to international gateways make Halong Bay one of Vietnam’s most popular places to visit. The Ha Long Bay archipelago is made up of 1,969 islands, both settled and uninhabited. These can be accessed from various ports, though in the special case of Cat Ba you can also arrive either by car, motorbike or bus (via Haiphong) or combined bus/boat (from Hanoi via Halong City). "Ha Long" means "Bay of Descending Dragons" (Chinese: 下龍灣), though prior to the 19th century this name was not recorded in any document or archive. 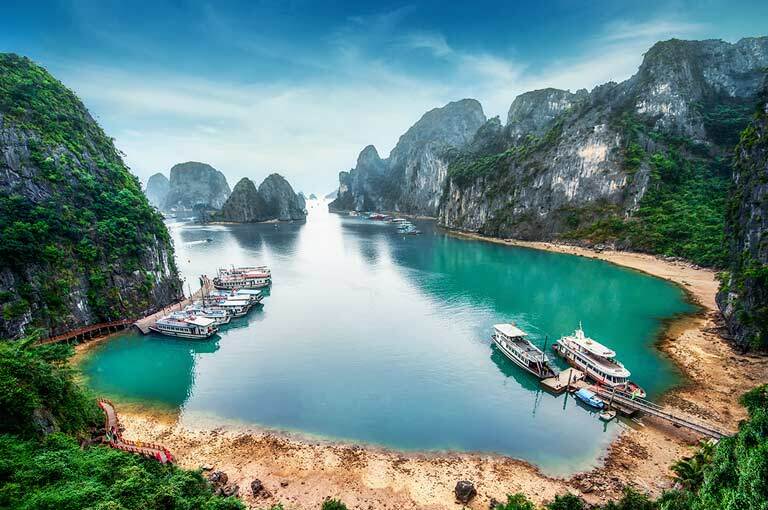 When mentioning the present-day Quang Ninh Sea or Ha Long Bay, old historical books often referred to them by the names of An Bang, Luc Thuy or Van Don. Not until the late 19th century did the name of Ha Long Bay appear on a French Marine Map. The Hai Phong News, a French newspaper of the time, had an article, Dragon appears on Ha Long Bay, reporting the following story: In 1898 a sub-lieutenant named Lagredin, captaining the Avalanse reported seeing a huge sea snake on Ha Long Bay. This was also witnessed by many of the crews. Thus emerged the European image of the Asian dragon. Whether this appearance of a strange animal looking like a dragon resulted the name of Ha Long Bay is not known. 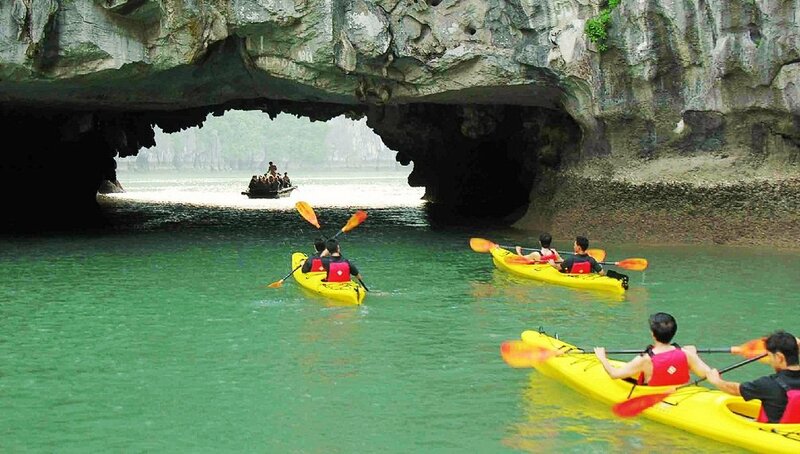 In Ha long Bay, there are around 1969 limestone rising from the sea. On top of each island has a massive amount of trees. There are several large caves located within the island. The biggest cave in the Bay area is a wooden cave, formerly known as the Grotte des Island. The largest islands in the Bay area Gad bah Island and Tuan Chau Island. There are people living permanently in these islands. On these islands, there are many beaches and hotels serving the tourists. Some small island is the Habitat of several animal species, such as chickens, antelope, wild monkeys and species of lizards. These islands are named from the shape such as Koh Chang, Koh Kaichon, Koh Langka etc. 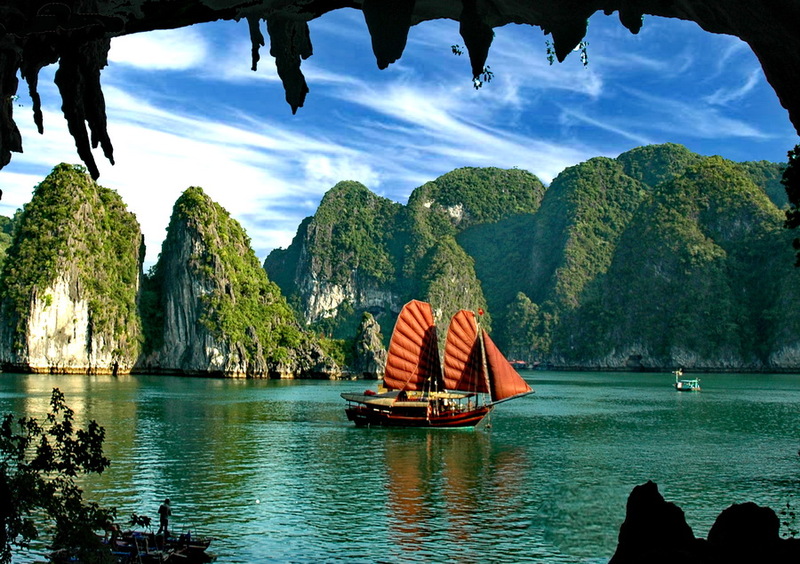 Ha Long Bay is a geographic work of art completed after millions of years of geological changes. While exploring the Bay, visitors will have a relaxing peaceful atmosphere. And more interestingly, you will feel like living in the fairy world with miraculous rock shapes, and grottoes with beautiful stalactites and stalagmites. Many islands have typical names of shapes or legendary stories about the islands. The Dau Nguoi Island is like a man standing and looking towards the mainland. Dragon Island is similar to a dragon merging up from the water green as jade. A number of other islands such as Cho Da Island, Dinh Huong Island and Trong Mai Island are all resemble to the shapes described. An island tourists can not miss during a visit is Titov Island, named after a former Soviet Union hero of the last century who ever traveled outer space. Inside the islands, there are wonderful and mysterious caves: Thien Cung, Dau Go, Sung Sot and Tam Cung. There is a bus from Hanoi to Halong city, 160 km away, takes roughly three and a half hours and from the bus station to the pier is about 15 minutes. Then you can go to the ferry pier which has the boat to go to Koh Gadbah island. Another choice is driving from Hanoi to Haiphong province. From bus station to the pier, it will take 10 minutes. Then, you can ride boat to Koh Bah which will take two hours. There are 4 main ways to transfer from Hanoi to Halong Bay: Mini Bus from Gia Lam (Hanoi) to Bai Chay (Ha Long). Tickets are bought at the ticket counter for 120,000 dong ($6 USD). The journey takes 4 to 5 hour with the bus stopping to pick up passengers along the way. If your bus departs Hanoi later than 10:00am it is unlikely that you will make it to Ha Long in time to catch the last ferry to Cat Ba at 3:00pm. * Note: City bus number 34 goes to Gia Lam for 5,000 dong from the following bus stops: Van Mieu, Hai Ba Trung, Nha Hat Lon, Bac Co, Chuong Duong. Be sure to wait for the bus on the side of the road where the traffic is flowing east or north. Otherwise you may end up on a longer than intended journey around the city. Do not attempt to board bus #34 from Dien Bien Phu. From My Dinh Bus Station (Hanoi) there are buses travelling to Bai Chay for 100,000 dong. They are faster and more comfortable than the "mini bus" from Gia Lam. City bus 34 goes to My Dinh bus station as well. [Jan 2014] From Bai Chay to Ha Long City/Tourist Wharf a motorbike taxi should cost 10,000 to 20,000 dong. From Bai Chay to Tuan Chau Wharf a motorbike taxi should cost 20,000 to 30,000 dong. From Ha Long City to Tuan Chau Wharf a motorbike taxi should cost 20,000 to 30,000 dong. A taxi to any of these locations could be more than double. By open bus: $15 USD one way, pick up & drop off at Bus Station By shuttle bus: Pick up & drop off passengers in the Ha Noi old quarter. 4-6 hours pending on how many stops en route the driver makes to pick up/drop off passengers. Fare is about US$10 each way. By Train: take cargo train from Hanoi to Yen Vien (Gia Lam) and then to Quang Ninh. The train starts at 4.30 am and arrives at 11am. The terminal at Ha Long City is near the Bai Chay bus station and about 5 km away from the harbour. Expect train delays and cancellations without notice. Hard sleeper only, $10 USD one way. (not recommend this transport). By rent a private car or taxi: take a car from Noibai,or from Hanoi centre to Halong bay. It costs $85 USD per car, per trip or $150 USD for a 2 days, 1 night. By Private car: Travelling by private car is considered the best choice due to its flexibility, safety, quality and valuable rates. It also seem be uniquely way to reach Ha Long bay from Noi Bai airport despite the taxi collection as it is indeed unsafe enough because of old age, careless drivers and non-competitive price. Some provider: Avis Vietnam, vietnamairporttransfer.com, Rental Car... By Seaplane: Take a seaplane flight from Noibai to Halong for only 45 minutes. Enjoy fabulous aerial views over the countryside and experience the thrill of a water landing at the Tuan Chau Island Marina. The flight can be extended to include an additional 15-minute scenic tour over the bay, which allows you to enjoy a bird’s eye view (150-300m high) of the thousands of limestone karsts jutting up from the jade green waters and see remote fishing villages before landing at Tuan Chau Island Marina.